I’ve been living life in the fast lane – it’s a complaint that many retirees make. They don’t know where the time goes. Is it forgetfulness? Or are we just so happy to be doing all the things we had hoped to do while grinding away at a day job – and now that we have time to do our own thing, time goes full tilt forward. All that, to say that about a month or six weeks ago, I had a blog comment from an upcoming artist, happy to have read my blog about Eri Ishii and expressing a wish for someone to publish a critique for his work. That piqued my interest and I arranged for a day in Vancouver where I would have enough time to go to his studio and see his work. We arrived around noon on a day threatening to rain. The apartment was one of those three story walk-ups from the post-War era, plain, utilitarian, covered with stucco complete with little glass bits in it. The way up to the apartment was a bit torturous, there being no single staircase, but off shoots. The numbering system was not in the best practices of current way-finding. When we entered, there was a strong odor of turpentine since his medium is oil on board and oil on canvas. Every bit of wall space was serving as storage space for his paintings ranging from a small size about 4 inches by 4, up to larger ones worthy of a entry way with 12 foot ceilings. One bedroom in his apartment was devoted to his studio and he was working at a painting at his easel; but there was another one set up with a painting in progress. There was a drop cloth on the floor to catch the spills, and my impression was that there was good reason to have the cloth there. He seems to work with a generous use of solvents and liquid paint. This young man, I’m guessing he’s in his thirties, had given up a prestigious and well-paid job as an art director with an electronic games company, voluntarily taking a demotion to be an artist within the electronic game industry with the same company, and then finally was frustrated with the interference he got from the new art director asking him to change his concepts this way and that. He decided to become a painter, full time. By the decoration or lack of, in his apartment you can see his complete devotion to his art. The walls are crammed with paintings, there is little furniture, the kitchen takes up no more room than necessary. His lovely wife is his muse. The vast majority of his work is figurative. I asked him where he had studied, but he replied that he had not taken any courses. He had learned everything from studying books, especially noting what his favourite masters did. Those would be Manet, van Gogh, Gaugin on the French side and Gustav Klimpt and maybe Egon Schiele on an Austrian note. The post-Impressionists of France and Germany – the Nabis, Fauves, and the Blue Riders – are also strong influences. His smaller paintings are of landscape and still life, in the genre of the sixty-minute artist or the “painting a day” school. 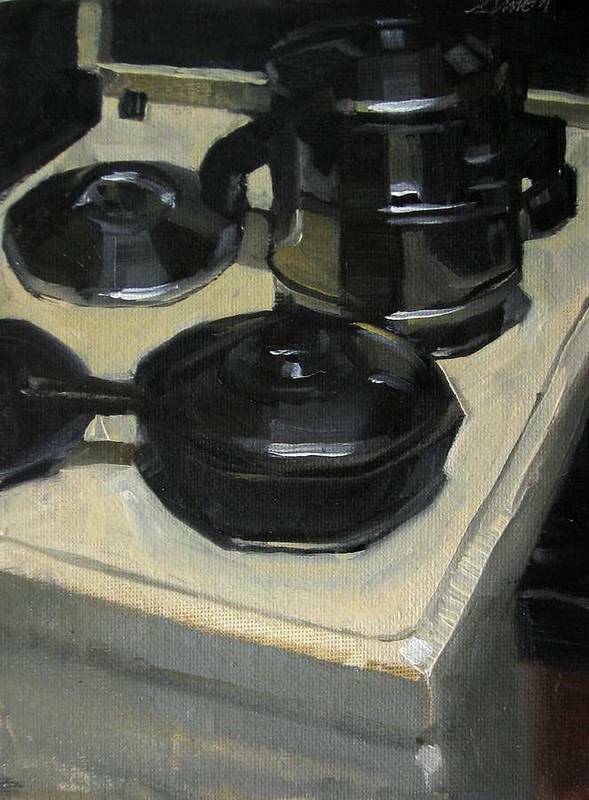 They are very fresh and painterly, often with subjects of mundane living – a collection of jars, a kitchen implement, the corner of a stove with a pot, glass ware, a corner of his studio materials. He finds beauty in the ordinary, the quotidian. 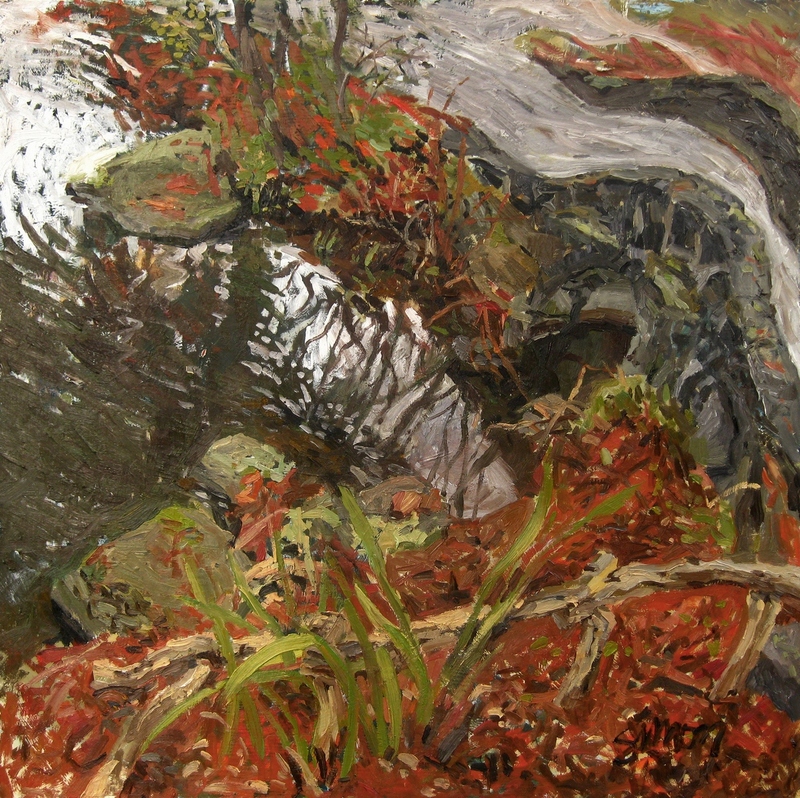 He has a gutsy way with his paint when tackling landscapes . He’s not afraid to load on the paint, and yet they are controlled, both with regard to his use of colour and his ability to describe a location – and at the same time, there is a liberty of brush stroke to be envied. It’s those paradoxical elements that make for luscious painting. In his figures, he uses strong colours like the post-Impressionists, especially the Nabis and the Fauves. With these, he uses almost a Cezanne- or Picasso- like cubism to define the rounding of shapes and yet there is a draftsman’s quality that is true to the proportion to the body. A quality that I like in these is that the forms are sensuous with a tender feeling of wonder at the beauty before him – there is not a drop of prurient disquiet. This is a young man to watch. He has already had some success with the Federation of Canadian Artists shows. He will find a niche here and maybe abroad if he continues in his search for expression. It’s good solid craftsmanship married to idea that concerns us all – our common surroundings, the spouse in our life and the environment in our neighbourhood. All these are things to which we can all relate. The trick will be for him to maintain his deep involvement with subject, for if he ever goes commercial, it would be a danger for him to slip over the wire into slick craftsmanship as a demand for product arises. And don’t be shy. If you live in Vancouver area and want a painting at a reasonable price, contact him through his web site. You’ll be encouraging an up-coming artist and doing yourself favour. This entry was posted on April 16, 2010 at 6:25 am and is filed under art, figure drawing, life drawing, oil painting, painting, representational art, Uncategorized. You can follow any responses to this entry through the RSS 2.0 feed. You can leave a response, or trackback from your own site. Thank-you for sharing. These are absolutely beautiful. Best of success to Simon! I am amazed at this work.